The Galaxy J1 has a conventional specs sheet. It sports a 4.3-inch WVGA TFT display with 480×800 pixel density. It is equipped with 1.2GHz quad core processor and runs on Android 4.4 KitKat. The inbuilt memory specifications include 768 MB RAM and 4 GB ROM, which can be upgraded up to 128 GB via microSD slot. Considering the camera, the Galaxy J1 features a 5MP rear shooter with Flash along with 2 MP front snapper. Connectivity options include MicroUSB, Bluetooth, Wi-Fi, Wi-Fi Direct, NFC and USB 2.0. The Dual SIM handset gets pepped up from the 1,850mAh battery. The device is available in blue, black and white colour variants. 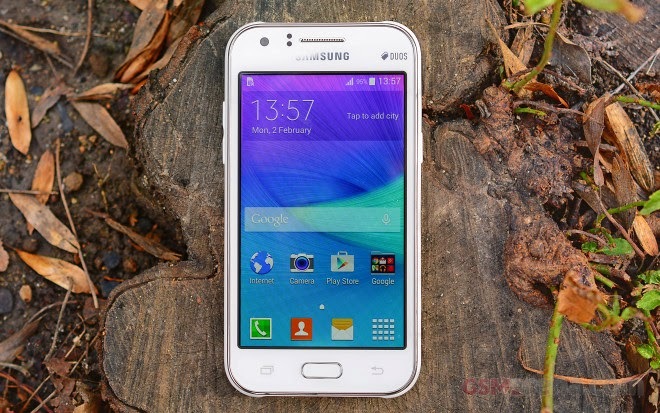 The software on board the Samsung Galaxy J1 is a simplified Android 4.4.4 KitKat-based TouchWiz UI. It offers the bare-bones TouchWz without the fancy productivity features we see in Samsung’s upper-level smartphones. TouchWiz is fast and smooth on the Galaxy J1 and we didn’t experience any hiccups and issues with it. How Internet and Smart Homes make Hacking Likey?